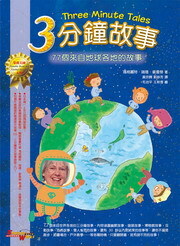 Bi-lingual Chinese (Mandarin/English edition of Three Minute Tales. Slightly rewritten for ESL uses. Published by East & West Book Co., a textbook publisher in Taiwan. Includes two CD's of author reading the stories in English.